I’m a new-ish fan of the blog, 10-year Greenpointer (what I call “outer” Greenpoint — Morgan near Driggs — as opposed to “upper” Greenpoint, meaning along the Manhattan/Franklin corridor), and bike commuter. I’m also a journalist who just finished a year reporting on urban spaces and infrastructure for PBS and public radio. 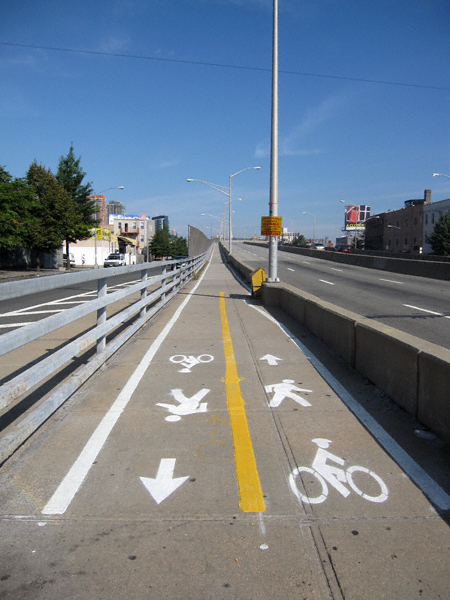 So after seeing the markings on the Pulaski Bridge path — and reading your posts — I decided to call someone who’d know what was up: Wiley Norvell, Communications Director for bike advocacy group Transportation Alternatives. I asked him about three things: (1) the “lane” markings on the ramps; (2) the seemingly-superfluous white lines along the main stretch of the path; and (3) the “Stop and Dismount — Walk Bike” signs. The bridge’s roadbed has the opposite problem: It has too much capacity, Wiley said. The evidence: cars routinely exceed the speed limit over the Newtown Creek by 15-20 MPH. “And that behavior continues on McGuinness Boulevard and into Long Island City,” Wiley said. So there’s a built-in solution that would solve both problems at once: Take a lane away from the roadbed and turn it into a dedicated cycle path. Wiley says Transportation Alternatives supports that idea, but it’s likely a long way off: The Pulaski Bridge was last rebuilt just 15 years ago, so any reconfiguration is likely years in the future. Hope this helps… Keep up the good work! No Rick, thank YOU for taking the time to give us the 411! If anyone has a question for Rick you can leave them in the comments or contact him via email at: rick (at) technopop (dot) org. P.S. : Rick was also kind enough to forward me a DOT presentation regarding the Pulaski Bridge. You can view it in jpeg format by clicking here. Wow. Thank you Rick and Heather for this. It’s both fascinating and frustrating, but I really appreciate the logic behind the white lines that were painted. As you may have noticed, I’m no fan of bicycles on the walkway (is it now just a path and not a walkway? ), but the fact I find far more distressing is that vehicles are entering Brooklyn at an average of 48mph. I knew people were speeding, but that’s outrageous.